WE’RE ALL LOOKING to have a decent quality of life, to live in a country where basic needs like healthcare are of a good standard and we can feel safe on the streets. It’s may not seem like much to ask but, as the maps below show, there is a massive difference in the quality of life in countries across the world. The maps, put together by Movehub display data from the Quality of Life Index, which takes in factors like safety, healthcare, consumer prices, purchasing power, traffic commute, pollution and property price to income ratio. Here’s how it looks on a global scale, with Ireland offering a generally high quality of life. Compared to other European countries, we also fare well, though not as well as places like Finland, Sweden, Norway and Germany. Despite that, we still didn’t make it into the top ten, ranking 25th in the world. Perhaps we should just be glad we’re not living in Cuba? 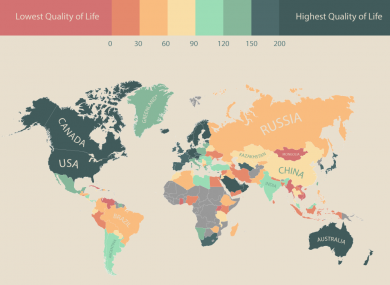 Email “The quality of life all over the world in one neat map”. Feedback on “The quality of life all over the world in one neat map”.